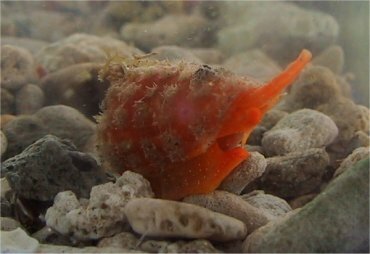 Even if many shells belong to the predator family and even if some of them may be lethal to human, they will try to hide as they can be themselves become a potential prey… Shells can be mainly hunted by shells (cone shells, murex shells,…), fishes (like sea rays, baliste fish,…) and octopus. 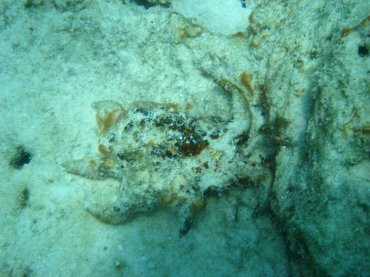 We noticed in aquarium that lobsters may break shells too (we saw lobsters breaking Conus regius shell in Martinique). – shells that remain exposed (fixed on substrat or not fixed). 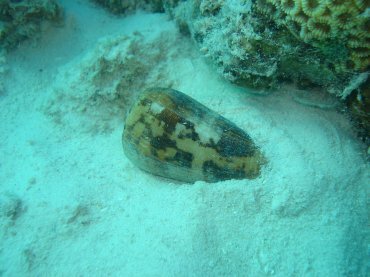 This type of shell do not need to be camouflated as they are burried (sometimes deeply). They may be detected by rays though. We find a lot of Bivalvia species, Terebridae shells and Olividae shells for example. 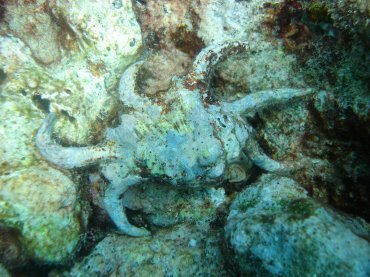 A lot of sea shells try to hide under something that cannot usually be overturned (except by octopus that can reach them with their tentacules). 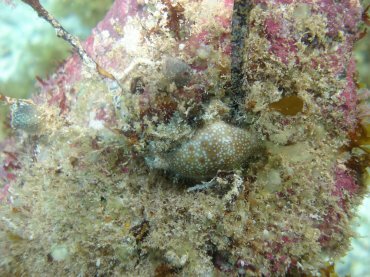 Big shells try to hide under huge plates of dead corals (ex: Conus aulicus) as small species may hide under smaller coral debris. A lot of Conidae do that, their are partially, totally ot not burried. 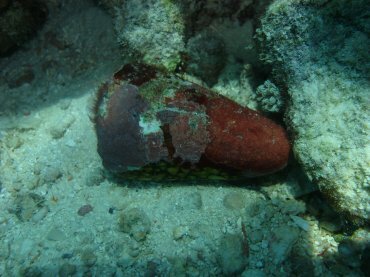 Cowries do that too but they live "head down", stuck under the coral fragment. 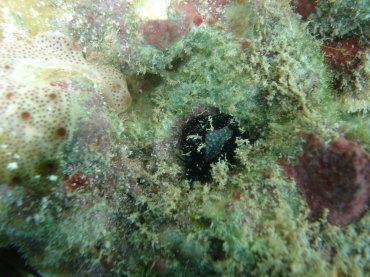 Cowries like to hide also in rock fissures, holes in dead corals. 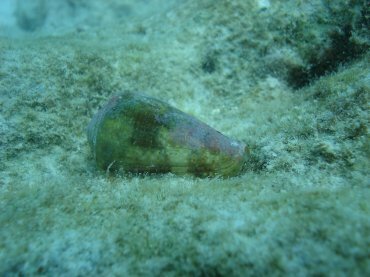 Some Conidae shells, even if they are often hidden, use their periostracum as a camouflage protection. 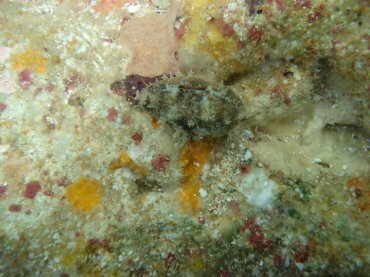 Some species have an opaque periostracum, some have algae looking periostracum. Cowries have a manthe that covers the entire shell when hidden. 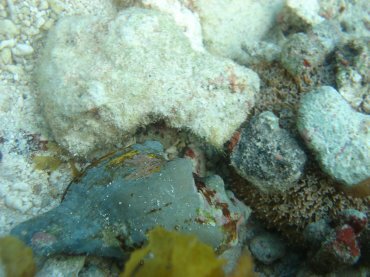 When you flip over a dead coral plate some cowries will keep their mantle and stay camouflated and some won't, often depending of the species. This king of sea shell have to be camouflated. 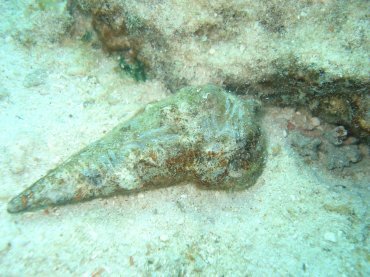 While snorkeling, you will find a lot of shells laying in the open. Many of them will use a camouflage protection against predator. 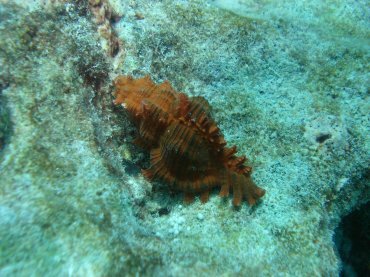 Fixed shells (on rocks, on dead corals) like many Bivalvia species let other organisms living on their shell like alge, crusting algae or worms. Cowries that will try to hide in sea grass beds like common Cypraea moneta will keep their mantle over their shell. 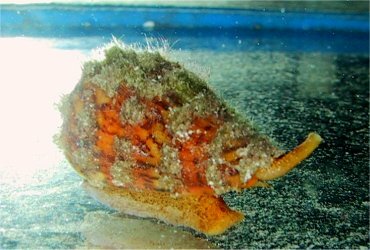 Conidae shell will have a periostracum opaque or close to algae and/or will let crusting algae living on their shell : Conus daucus, Conus boui, Conus litoglyphus have an algae looking periostracum and often are partially or totally covered by crusting algae. Conus terebra have an opaque periostracum. 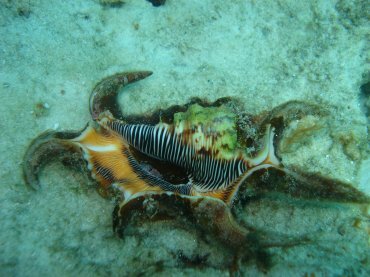 Murex shells can sometime be so difficult to spot as they have often corals or crusted algae all over the shell.